Off-grid solar lighting products are rapidly becoming the primary mode of illuminating remote areas in developing and under-developed countries where grid infrastructure is either non-existent or is highly unreliable and incompetent. Nearly 18% of the world’s population had no access to electricity as of 2013, making the demographic directly dependent on solid fuels such as coal and wood and liquid fuels such as kerosene for lighting purposes. Of these, kerosene takes a major share and is estimated to account for nearly US$30 bn in expenses directly incurred by millions of households across the globe every year for lighting purposes only. Off-grid solar lighting products are efficient contenders to this supposedly cleaner fuel (as compared to solid fuels such as wood and coal) and are gaining increased attention from governments and consumers alike. TMR projects that by completely replacing kerosene with off-grid solar power products, the annual costs on lighting incurred by the world’s off-grid population can be brought down by 10% to 15%. Savings of this level can have a major impact on the overall development of developing economies. Environmental benefits of switching to a cleaner energy source such as solar power are also vast. Solar lantern systems and solar home systems are currently two of the most popular off-grid solar lighting products in the market. Of these, solar lantern systems have been more preferred than solar home systems in the past years, majorly owing to portability, low cost, and fewer constituent elements in these systems, which make their maintenance easy. TMR states that 6.42 mn units of solar lantern systems were sold across the globe. With 3.56 mn units sold in the global market in the same year, solar home systems accounted for a comparatively low share in the market. Over 2014-2024 as well, solar lantern systems will be the dominant product type and their sales are expected to rise to 47.53 mn units by 2024. Sales of solar home systems are projected to rise to 34.44 mn units by 2024. 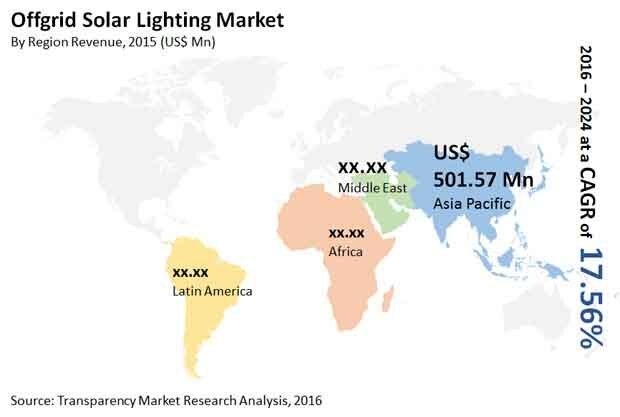 In terms of revenue, the market for solar lantern systems is expected to rise from US$386.31 mn in 2014 to US$2360 mn by 2024. Poor grid infrastructure in several African countries has led to major growth opportunities for the off-grid solar lighting market in the region in the past years. With rising intervention of government and increased awareness among consumers, Africa is expected to emerge as a highly lucrative regional market for off-grid solar lighting products in future years as well. Nevertheless, Asia Pacific will emerge as the leading regional market owing to favorable regulatory platform and provision of direct subsidies for solar lantern systems for household usage. Asia Pacific will account for the largest 50.51% share, Africa will account for the second largest share at 46.63% in the global off-grid solar lighting market by 2024. The rising consumer base of mobile devices such as smartphones and tablets in Asia Pacific will also boost the consumption of innovative off-grid solar power products capable of charging these products. The unreliable grid infrastructure, frequent power cuts, and complete unavailability of grid in certain remote locations of Asia Pacific will prompt mobile users to go for the cost-efficient and reliable off grid solar products. In India, which is one of the most lucrative markets for off-grid solar lighting systems with around 260 million households directly dependent on off-grid lighting options, government bodies are taking active measures to increase the adoption of solar lighting systems in remote parts of the country. The Ministry of New and Renewable Energy (MNRE) in India plays a major role in launching public missions such as The Jawaharlal Nehru National Solar Mission (JNNSM), which aims at increasing the adoption of solar home systems in the country to 15 mn by 2022. Meanwhile, Latin America will have a meagre 1.64% share in the global off-grid solar lighting market by 2024 owing to low consumer awareness about the innovative and cleaner solar lighting products. This research study analyzes the off-grid solar lighting market in terms of volume (million units) and revenue (US$ Mn). The market has been segmented on the basis of type and geography. For the research, 2015 has been taken as the base year, while all forecasts have been given for the period from 2016 to 2024. Market data for all the segments has been provided at the regional and country level from 2015 to 2024. The report provides a broad competitive analysis of companies engaged in the off-grid solar lighting business. The report also includes the key market dynamics such as drivers, restraints, and opportunities affecting the off-grid solar lighting market. These market dynamics were analyzed in detail and are illustrated in the report with the help of supporting graphs and tables. The report also provides a comprehensive industry analysis of off-grid solar lighting with the help of Porter’s Five Forces model. This analysis helps in understanding the five major forces that affect the market structure and profitability of the off-grid solar lighting market. The forces analyzed are bargaining power of buyers, bargaining power of suppliers, threat of new entrants, threat of substitutes, and degree of competition. The high-level analysis in the report provides detailed insights into the off-grid solar lighting business globally. There are currently numerous drivers of the market. One of the most prominent drivers is decreasing cost of off-grid solar lighting products. Market attractiveness analysis was carried out for the off-grid solar lighting market on the basis of revenue realization and industrial growth. Market attractiveness was estimated on the basis of common parameters that directly impact the market in different regions. The off-grid solar lighting market was analyzed across four regions: Asia Pacific, Africa, Latin America, and the Middle East. These regions are further segmented by country and type of installed off-grid solar lightings globally. Segmentation on the basis of types (solar lantern system (SLS), solar home system (SHS), and large solar home system (LSHS) has been provided for each country and region. Regional data has been provided for each sub-segment of the off-grid solar lighting market. Some of the key manufacturers of off-grid solar lightings are Koninklijke Philips N.V., OSRAM GmbH, Niwa Solar, Tata Power Solar Systems Ltd., SunnyMoney, Omnivoltaic Power Co. Ltd., WakaWaka, BBOXX Ltd., Sinoware Technology Co. Ltd., and Azuri Technologies Ltd.